Click to Call - The ability to launch calls to contacts with a single click straight from the CRM application. No need to retype the phone number. Call Pop-ups - Inbound calls are automatically linked to a customer record based on their caller ID and the customer record is brought up automatically upon receiving a call. This saves time for customer service personnel and allows more professional handling of calls, creating a better impression for customers. 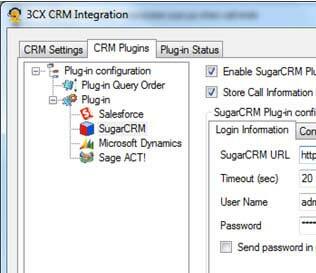 Call Journals - All calls are logged as call records in the CRM package. This allows sales personnel to easily keep track of calls made to a customer and to take notes of what needs to be actioned. Integrating 3CX Phone System Pro with your CRM allows for more accurate activity reports as all calls are automatically logged without the need for the user to manually create the records. Missed calls are logged and linked to the customer’s record so that customer service personnel can quickly call them back. CRM integration for Microsoft Outlook comes as standard with the 3CX Phone System commercial license. Users of other CRM applications require a 3CX Phone System Pro License. Upgrade or purchase the Pro edition today!